How much do YOU love YOUR Shadow? This Shadow is gold plated! The picture was sent in from the Shadow Club USA. It was taken at the Honda Hoot 1995. See what you miss when you don't take part! Believe me, some of us who can't would like to... and its so strange to us, who can't, that some who can, don't! Every now and then someone sends in an amazing piture of what they have achieved with their Shadow... On this page you will find stunning pictures sent in by Shadow Owners that are too good to miss! 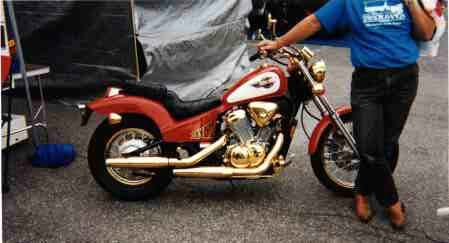 Be it amazing customs, cool, stunning, strange or wonderful looking bikes, or similar. Got one?